Majority of White Evangelicals Back Way for Unauthorized Immigrants to Stay in U.S. In recent weeks, several major news outlets — including the New York Times, Wall Street Journal and the Washington Post –have carried stories about evangelical groups supporting steps to overhaul the nation’s immigration laws. Our survey in March found that 62% of white evangelical Protestants said there should be a way for immigrants who are currently in the U.S. illegally and who meet certain requirements to stay in the country. Four-in-ten backed a path to citizenship while 24% said preferred conferring permanent residency. 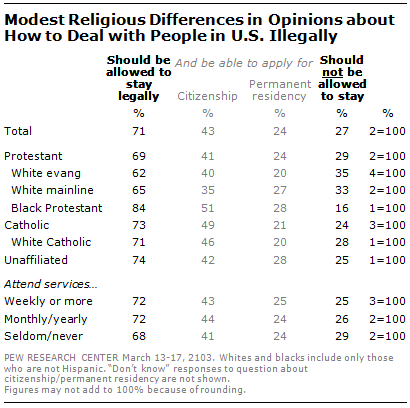 However, support among white Evangelicals for allowing unauthorized immigrants to stay in the U.S. legally is lower than that of the overall public (71%) and other religious groups.